Well here is my Main Self-Moc with my secondary being Toa Voxumo Toa of Ice. here is the gallery for him on mocpages http://www.mocpages.com/moc.php/241821and here is all the information on himVoxumoBiographyVoxumo was the first living creation of the great beings. Due to their success voxumo was given a large portion of the ocean part of spherus magna. They also gave him the task of creating an island that if needed could hold the whole population of spherus magna the matoran universe and the native wild life. So voxumo started the process of creating matru a island 20 mio wide ( 17,000 miles) and 23 mio long (19,550 miles) along with the odes islands with each averaging about 5 mio wide ( 4,250 miles) and 7 mio long ( 5,950 miles). The great beings also gave him six beginning powers water, plant life, stone, earth, fire and ice. With these powers he spent 30,000 years completing the island adding flora, underground tunnels, volcanoes, rivers, lakes, mountains, deserts, canyons. 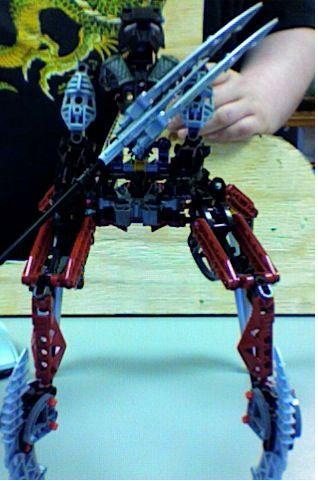 After he completed the island the great beings contacted him giving him another task they knew the core war was going to possibly destroy spherus magna so at that time they created mata-nui and told matru that if spherus magna made it that mata-nui would one day return to spherus magna he was to take mata-nui’s soul and take it out of the robot and create him a new biomechanical body and artakha would come to voxumo and the two would work on upgrading the matoran universe to run on automatic so it could sustain the ability to monitor gravity and other life essentials and put wards into it that would prevent any being from gaining control of the robot. Well in voxumo’s reality all the event’s that took place in the main reality took place even the crashing of mata-nui into the ocean of spherus magna except towards the end the toa nuva did awaken mata-nui but instead of teridax taking control of the robot mata-nui was able to gain control but before mata-nui regained control teridax teleported all the makuta from karda-nui. The order also never declared war or revealed their existence and those that had learned of the order that were not members such as takanuva, the toa mahri etc had their mind wiped of ever knowing about the order although they remember receiving help but not from whom. Once mata-nui took control artakha contacted mata-nui telling him of the great being wish mata-nui never rose from underneath of the ocean. Instead he teleported artakha and voxumo to the chamber underneath the coliseum to discuss how they were going to begin the process of running automatic. After discussing for a week they found a way and started the process. Now mata-nui is in the ignika and in glatorian form. The second task was to merge the agori society and the matoran society which was really simple task although once they merged an event took place that still makes no sense all the beings that had died in the matoran universe came back in front of the gathered society in perfect condition as if they never died. Although even the brotherhood was accepted into the society but were given the odes islands. After the societies were merged the society started building the cities on matru each city was the size of the whole of metru-nui it took 10,000 years for the matoran and agori societies to merge perfectly and the cities to be finished. During this time voxumo and artakha created a system of teleportation centers that allowed easy travel from the matoran universe, matru and the villages of spherus magna. 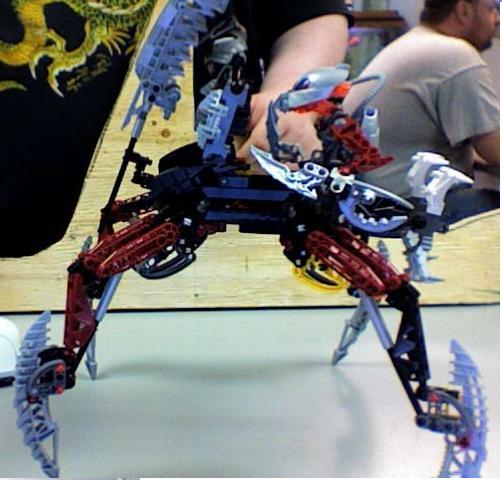 During the time voxumo spent waiting for mata-nui to come he created nili his only living creation. Voxumo also brought rahi from the matoran universe onto matru and rahi from spherus magna to matru where the two type of wildlife could learn to coexist. Now at 140,000 years into his existence voxumo has successfully brought two societies together and brought semi peace to his reality he is now taking it easy and just enjoying life while taking a leadership role of his matru. Voxumo is often refered to as the “Reality Walker” by other beings. Due to how often he journeys from the elintari realty to other realities.AnatomyVoxumo stands about 12 feet high when in his original form (he can change his height depending on the situation). Voxumo also has two wings for flight each wing from tip to end are about 15 feet long. Reason for such large wings is so the can actually bear Voxumo’s weight so he can achieve flight (like the rest of him they can adjust to different sizes. Although Voxumo can change sizes his weight always stays at 800 pounds. Voxumo’s body is made of a special living substance created by the great beings. The substance is made up of spiders each about the size of an atom. There are 2 types: tissue making up his flesh and the other protosteel which makes up his armor. Unlike zaktan he does not appear to be shifting when he is standing still due to the spiders latching together via web that the spiders produce that is harder than protosteel. Each spider holds a minuscule amount of his conscious. If one of the spiders comes unattached involuntarily from the rest that spider dies. But for each spider that dies 50 more are created. Voxumo can only detach 20 voluntarily but they will only survive for 1 hour. The spiders can change along with voxumo for example they can become intangible or increase in size. Voxumo’s kanohi is also made of the spiders but has its own limited conscious. Both voxumo’s and the kanohi fali’s minds are linked. Voxumo’s body is made up of 20 billion+ of the spiders. Due to his unique form if his head were cut off the spiders would recreate his head and mask. Voxumo is not invincible for he can still be harmed by weapons it’s just the spiders heal him quickly but he is still left with the sensation of the pain just the physical evidence is removed. If he does take enough damage he can black out even though the damage is healed. The great beings made the spiders resistant to powers that would normally destroy a body. (Example if he were covered in plasma his body would not melt but he would feel intense burning or if the shadowed one used his eyebeams they would not work but voxumo would feel intense pain same applies to dematerializing powers or spinners etc...). If someone were to look at voxumo he would appear to be one whole mass instead of separate pieces that is how good the great being made him but if he takes damage the wound would look like it was made of separate pieces till it healed. Voxumo finally thought of a name for the spiders, the icanuga or reality spiders although when he talks about them he treats them like their there own individuals instead of a part of him even though they are a part of him.Tools/powersWhat allows voxumo to have so many powers is that each icanuga can store a single power physical or non physical as long as voxumo has seen that power in action. The kanohi fail or the mask of change is very similar to voxumo’s except the powers it’s icanuga hold have to be mask powers but upgrades them to nuva level powers. If voxumo want to summon a power he has to summon the icanuga with that power to the middle of his hand to access the power and he can only summon 2 at a time (2 hands two powers) the power does not just have to be physical (example he can summon the power of fire and telepathy at the same time). Another benefit of his mask is due to it’s limited conscious if he activates a mask power in the middle of battle the fali will keep that power going until he decides to shut it off. Along with the kanohi fail voxumo also has 2 midak skyblaster style weapons that will create a sphere of power that will take on a physical power (example if voxumo were to summon the power of acid the blasters would fire spheres of acid or if he summoned the power of ice the blasters would fire spheres of solid ice. The blasters will not work with powers like telepathy or rahi control.) Voxumo also wield akaden a living staff. Akaden was at one time a fe-matoran that looked up to voxumo and wished to benefit him someway. So akaden experimented on him self till he found a way to merge his body with a weapon he had made. So he went to voxumo asking if he could forge a weapon for him. Voxumo agreed and told akaden that he wanted a staff that had a triple blade attached to the staff. So akaden forged the weapon and once complete merged his body and mind with the staff creating a weapon that would return to voxumo and was unbreakable. So he convinced a matoran that was his friend to deliver him to voxumo. Once voxumo took a hold of akaden, akaden forged a mental link with voxumo so they could communicate. Since then voxumo has wielded akaden as his primary weapon. Here's one of the reviews you requested! ^^First off, I'll say that large MOCs are usually difficult to build. You succeeded in making everything flow together well, all the elements incorporated into it not just thrown together. It looks like you spent a great deal of time and put a lot of care into it to create this result.I really liked the design and color. The simplistic black and silver colors aren't flashy, but also makes it interesting and mysterious. A four-legged design is usually tricky to do, but you passed with flying colors. The spider-like back legs you had were creative, especially the choice of pieces.And I'm curious: Where'd you get the grey Maxilos mask? Just out of curiosity. Also, I see black Zamor spheres, or something like that in the Zamor launcher.Still, I hope this review was satisfactory. Anyway, this is an awesome MOC. Great job, and keep up the good work! actually it's a white maxilos mask and i spray painted it along with the zamor spheres which after the black zamor sphere there is a white zamor sphere., in fact everything on him has been spray painted.What do you think of the background?Also it took me about 3 years to build it he was originally made for the makuta contest in 2008.I actually have pictures of his first designs when he was called matru I'll tell you right now that over 6 sets went into him. And i based the legs from fenrahks legs. also what do you think of the weapon and wings? Edited by Chi Keeper Cho Voxumo-Chan, Nov 22 2011 - 09:45 PM. That's kinda cool, because they're custom painted pieces. It makes it a little bit more special. And the background is cool, by the way. ^^The original design is pretty neat, but I have to admit, the final result is still awesome. Good pictures - and three years? Wow, that's pretty impressive. And yeah, the weapons are interesting. I do like the wings, too - I feel bad for not mentioning them and the weapons at first, but I was busy with something else so I forgot to add them in. =PI like the original, too, though, and the choice of mask. And I think the only thing I've made that I've put a lot of sets into was the Kardas Dragon, either that or a gold Thok, which only consisted of three to four sets, lol. Well i'm glad you like it. the background from the original pics is actually just printer paper taped onto a cardboard box. I there anything you think i should change?oh you must mean the background story. it took me about a year to decide what the background would be like. and i wanted to make him special since he is my self-moc and the first one i made. I really am glad you like it.